Margaret Thatcher famously said the problem with socialist governments is that, “They always run out of other people’s money.” Unfortunately, that’s true for almost all governments. Even more unfortunate, though, is that some people refuse to believe that government can ever run out of other people’s money. Unpacking the economic ignorance embedded in that claim would take all day. So let’s set aside the question of how the government will be able to pay off the debt in the future and focus instead on the part of the debt the government pays right now: interest. 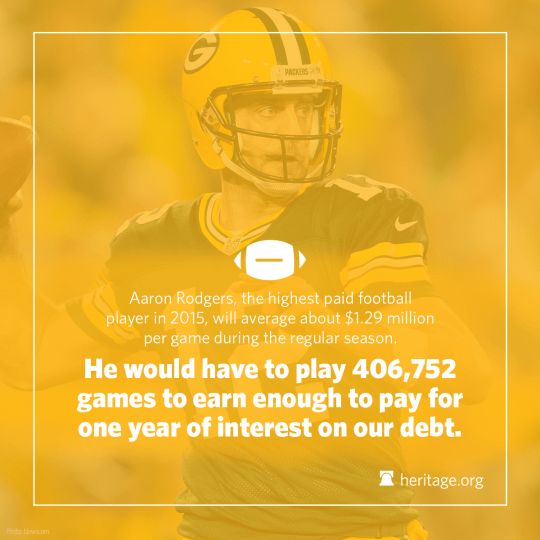 How does government pay that interest? The answer, of course, is with “other people’s money” (i.e., taxes). Interest on the debt is paid out of the tax dollars that are taken from the American people. That is money that comes out of our pockets today to pay for money we borrowed in the past. And it’s a lot of money. True, if we measure it as a percentage of the total federal budget, the amount paid in interest doesn’t seem like a lot—only about 7 percent. But what this overlooks is that the percentage can be made to appear even lower by simply increasing spending in other areas. If you spend more on any other category of the federal budget then the category of interest payments will be smaller, at least as a relative proportion of the overall budget. Looking at interest payments only as a percentage of the budget doesn’t tell us much about what is required to actually pay those payments. A better number for our purposes is the total amount we have to pay in interest expense each fiscal year. In 2015 that total came to $402,435,356,075.49. Maybe you’re not a sports fan, or maybe that number is still too big. The human brain wasn’t designed to comprehend a numbers that large, so let’s break it down into a smaller (though still difficult to process) number: $1,102,562,619.38. That’s the interest that accrues every single day. 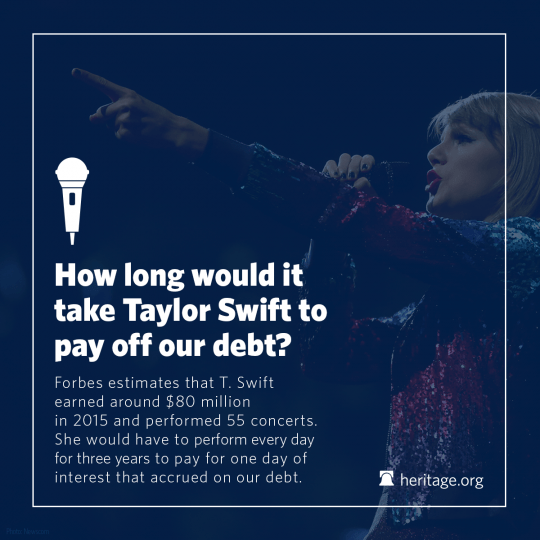 How long would it take Taylor Swift to pay just a single day’s worth of interest on the debt? To pay all the interest for the entire year, we’d need about 1,095 more Taylor Swifts who do nothing but give concerts every day and give their entire proceeds to the government. While in many ways that would be awesome (who wouldn’t want a world with more Taylor Swifts? ), that’s not a viable option. To paraphrase Thatcher, when it comes to paying the interest on the national debt, the government will eventually run out of Taylor Swift’s money.